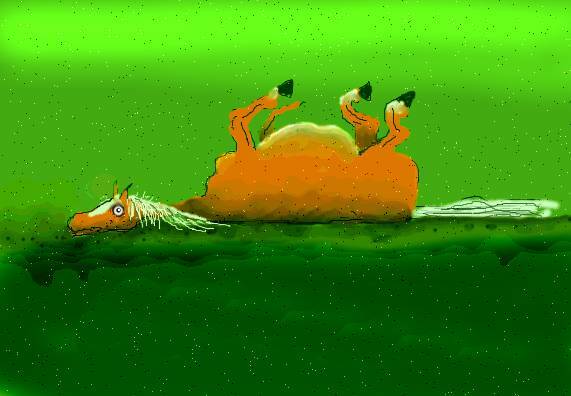 This little horse was in deep crisis. She had, some time during the night, managed to squirm her way under a fence into lush pasture and was suffering from violent colic. Her abdomen was drum-tight and she alternated between stretching out in a vain attempt to relieve the pressure, and lying on her back with her legs held rigidly vertical in the air and a close to panic expression in her eyes. It was estimated that she had been in this state for around 6 hours. Brie is an extremely small horse – even by miniature horse standards – with an ENORMOUS sense of her place on the planet and a passion for drama. She lives in a herd of four miniatures, where she is both the smallest and the only one not related to the others. From time to time, she separates herself from the herd and stands gazing into space, seemingly in a world of her own. Brie’s belief in the adage “it’s always greener on the other side of the fence” is unshakeable. This philosophy has had uncomfortable consequences for her on several other occasions but this episode was by far the worst. A vet had been called in; the diagnosis and prognosis were not good. She had most likely twisted her gut in her attempts to find relief, which often results in part of the intestine becoming necrotic. It was felt that the only solution was to transport her to the nearest Equine hospital – 7 hours away – for major surgery. It was unlikely, however, that she would survive such a journey or the subsequent operation. While these discussions took place, Brie again lay on her back, legs in the air, neck and head stretched out on the ground. This time, however, her eyes were glazed and fixed as though she was gazing into a different realm. She was completely unresponsive to anything happening around her. Based on her state of collapse, bloated rumbling abdomen, lack of heat in her legs, and the feeling that she had travelled outside of her body, Brie was given 2 doses of Carbo veg 200, 10 mins apart. Within 60 seconds of the 2nd dose, she leapt to her feet, barged her way into the group of horses eating their breakfast and started chomping voraciously into the hay. Within another 5 minutes Brie’s abdomen was completely soft and pliable and she was showing no signs of pain or discomfort. She was no longer staring into the distance as though she was temporarily on another plane. Carbo veg appears under the rubrics MIND; DELUSION, Spectres, sees and MIND: FEAR, ghosts, of. Vicki Mathison Dip Hom, B.A.Psych. Vicki practices in Nelson, New Zealand, with humans and animals - treating horses being her particular passion. Great case, thank you Vicki! Very good interpretation of the horse, I will remember this case!